This week I am linking up again with Clearly Bex for another Trendy Tot Thursday. As Olivia is such a little poser this is the perfect link up for her. Currently she is really into her girly dresses, last weeks outfit was one of my favourite dresses on her and this week is the same. As soon as I saw this dress I had to have it for her whether she liked it or not! The colours are beautiful so light and fresh and summery I would have had one if it came in my size too! We both have a thing for maxi dresses of late. So about the dress, it is from Primark and was only £8! £8!!!!!!!!!!!!!!!! Seriously it was such a bargain. 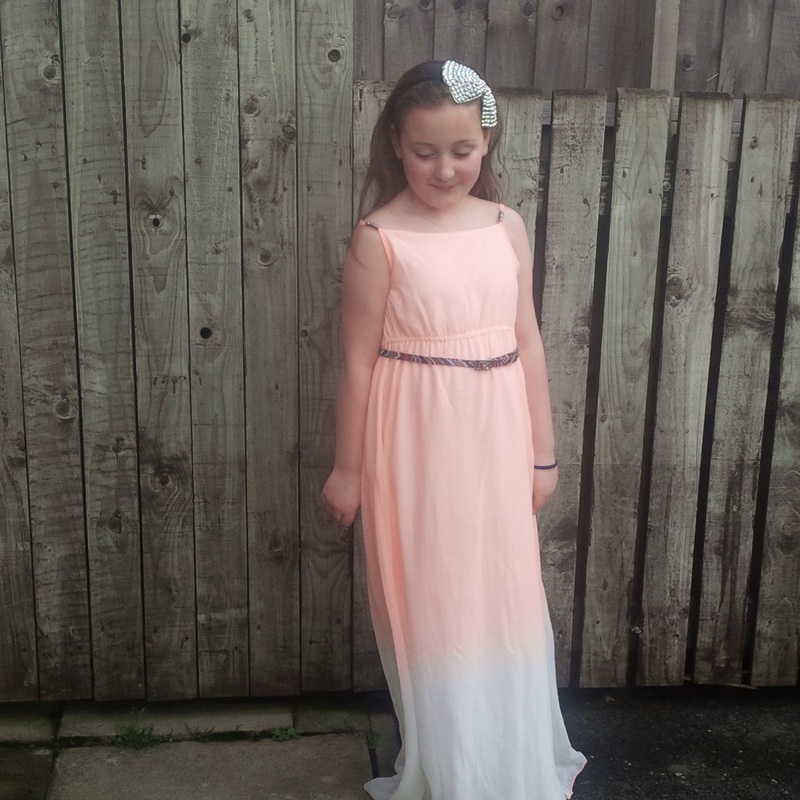 She has it in size 11-12 so currently, it still trails on the floor a little bit but she does wear it with wedges, at 8 years old! god, help me when hits the teenage years is all I can say. There are little beads on the strap and a matching belt too. I just really love these colours and she says it makes her feel like a princess what more could you want. She has styled it with a hair band she got for her birthday and a loom band (damn things make an appearance everywhere). So there we go this weeks outfit! What do you think? Thanks she loves it and I couldn't not buy it for that price really just wish I could get clothes that nice for that price for me!